This research integrates cognitively based lexical semantics and formal syntactic analyses with relation to philosophy and logic of language. 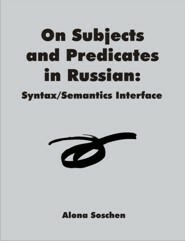 It deals with a broad range of issues and contributes relevant observations and analysis by offering a new approach to lexical and syntactic representations. Different theoretical frameworks are employed within the compass of generative syntax/ semantics. Data from Russian and other languages (Ukrainian, Bulgarian, Romance languages, English, Hebrew) are analyzed to bring out the nature of the categories each language possesses. To answer the question of how semantically empty elements are interpreted by conceptual system, special attention is paid to null categories in Russian (pro of impersonal sentences, pro of existential sentences). Two subject positions on the verb's argument grid are examined, and the conclusion is drawn concerning the existing parallelism of lexical (micro-) and syntactic (macro-) models. The 'indirect', or 'null', subject position is considered more general and encompassing in both cases. The latter (macro-)model associates semantic generic/ non-generic distinction of sentences with two functional heads Tense and Agreement in English, Russian, Hebrew, and Spanish. The notion of genericity now includes a personal level, e.g. when a certain property holds in all situations possible for an individual. The study employs predication theory to relate semantic components to formal syntactic descriptions; as an example, certain adjectival predicates that do not participate in generic formation are represented as unsaturated functions of states. The research closely relates the issue of syntactic predication to a cognitive approach to lexical units as sets of categorial features, in order to enhance our understanding of categorization and the way words are combined in lexical units. Following Chomsky (2000, 2001), predication is viewed as an operation of Merge on two syntactic elements, which supports the idea of a direct connection between certain syntactic representations (e.g. small clauses) and the initial stages of language acquisition. Predication relations are re-examined as the set of ordered functions where not only their number but direction is of importance, as they apply both on the sentence level and within modified NPs. The structures of transitive vs. intransitive verbs and their arguments are investigated as a way of exploring the minimal links of predication. According to the results of this research, these models, analyzed as 'layered' in the sense that they can be projected into syntax by parts, exhibit cross-linguistic consistency. The conclusion is that lexical arguments must be assessed from the point of view of their place in the hierarchy of events/ states. A detailed analysis of the properties of the 'result' layer leads one to the issue of reflexivity. The analysis of reflexive structures in Slavic and Romance languages is followed to establish a link between the syntactic properties of reflexive verbs and the cognitive notion of our access to ourselves (following Chierchia 1989). The ultimate goal of this research is to stimulate further work towards the development of interdisciplinary approaches to the study of language, and to contribute to our knowledge of natural language universals.